bananaquilts: Hurrah Hurrah for Boorowa! The centre of Australia-R! 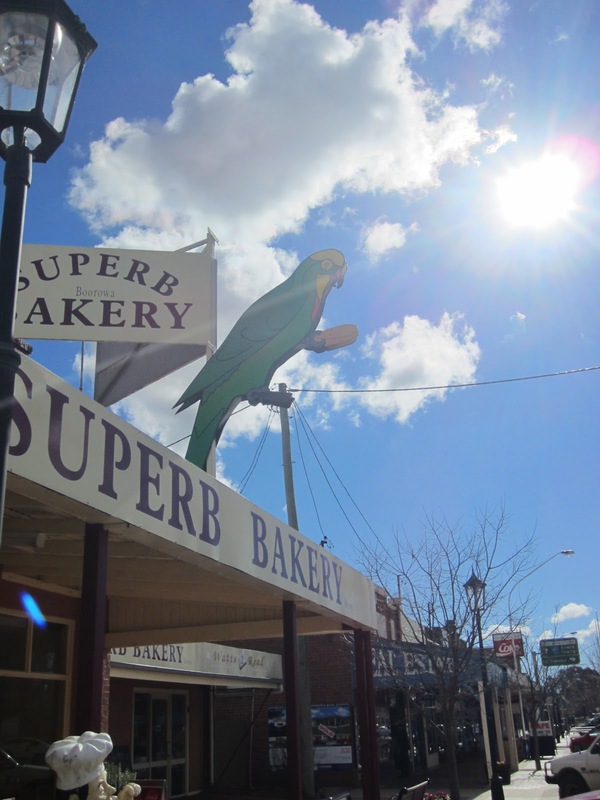 Hurrah Hurrah for Boorowa! The centre of Australia-R! The convent in the middle of Boorowa. Yesterday Mum, the Pickle and I headed off on an excursion to Boorowa. The Pickle did not want to go, she said she would rather stay home and play Little Big Planet. But we let her play her DS in the car with a blanket over her head so she cheered up. Mum and I were excited from the start - a nice drive through the countryside, a visit to Vinnies, a rabbit from the butcher for Dad - what's not to like? The day was grey and misty as we set off from Canberra. We stopped off at Yass, where we called in to the local St Vinnies and Mum bought a navy cotton cardigan, made in Australia. So few garments are Australian made these days, you really do have to look in the op shops if you are looking for Australian quality. Off we went along the Hume Highway, which is the main road between Sydney and Melbourne, and not far out of Yass we turned off onto the road to Boorowa. As we passed some Alpaca grazing in the paddocks, the fog lifted and all of a sudden we had a blue, sunshiney sky. Just about 1200 people live in the town of Boorowa. 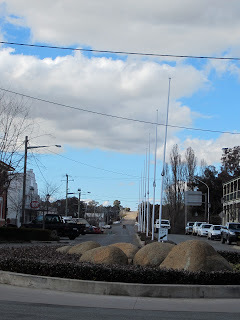 The local council has in recent years upgraded their main street with new paving, roundabouts featuring boulders, flagpoles lined up along the road and tubs of flowers. These cerise coloured primulas took our fancy. We called into the Superb Cafe for morning tea/lunch. There was a bar at the window where we sat and looked out at the main street. A hay truck was parked out there. A few cattle trucks drove past. Some were full, some were empty. Mum commented that there must be a sale on. Boorowa is the habitat of a threatened parrot called the superb parrot. Imagine a very pretty, green budgie-ish bird. Here is one up close and here is some more information about it. One of the laws they have is that you are not allowed to cut down old dead trees, since these provide the hollows the birds need for their nests. The farmers also seem to be growing beautiful stands of gum trees along their fences so that they will have the hollows they need in the future. First stop after lunch was the Fibre Filia store, where a gentleman was weaving the most beautiful wool using a loom. We bought some wool made in NZ out of merino wool and possum. How do you shear a possum? I hear you ask. Well, in NZ the possum is a pest and a feral animal. They kill the possums and take their fur from them once they are dead. The Aussie possums were let loose into NZ years ago so they could be used for their skins, but this turned out to be a terrible mistake, since they have caused incredible damage to the eco system. The merino-possum wool is Touch brand. It feels like cashmere, and is hardwearing. The colour we chose is an olive greenish brown, the shade is called "dark haze" Mum is going to knit me a cardigan, and I think she will really enjoy handling such beautiful wool. You can see the pattern here. She's going to get cracking on it just as soon as I roll the big skeins up into balls for her. Fibre Filia does not have a website just yet, although I did suggest that to them. We dropped into St Vinnies where I bought a stripey cotton t-shirt, a really thick one made in Australia. I looked up the website of the manufacturer, Elliot Kennedy Australia, to see if they are still in business. They are, and their t-shirts retail for $130 so I feel I nabbed a good bargain! Here is the Vinnies, in the middle. You can see in the foreground the diagonal lines for folks to park, in this town they park nose to the gutter. The next shop was Superb Patchwork. This shop is set in a huge building, once the premises of a cabinet maker. It had really high ceilings, with a mezzanine level, and all around the railings were hung quilts which were for sale. I did not take any photos for fear of offending the owner but the quilts really did look spectacular displayed like that. Here is Mum standing outside. Mum noticed a doll's pram in the window which was the same as the one she had as a little girl. 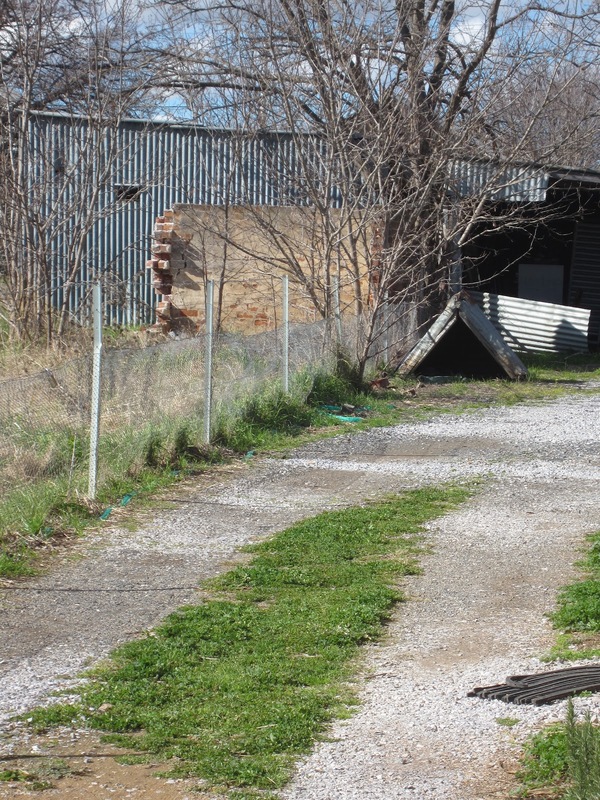 Just along from the patchwork shop was a welder's yard. Across the road we noticed some lovely native grasses growing back in the gaps between the shops. This I am guessing makes good parrot food? 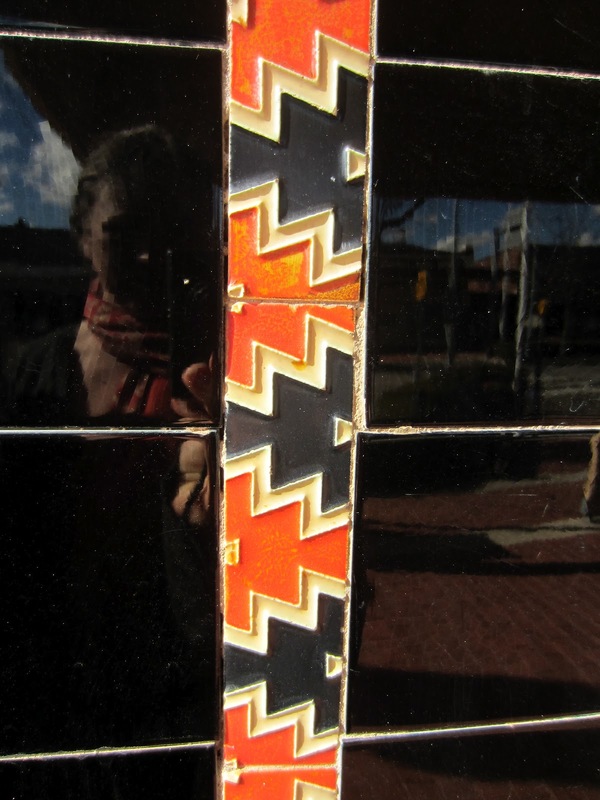 The shops had lovely old tile work. 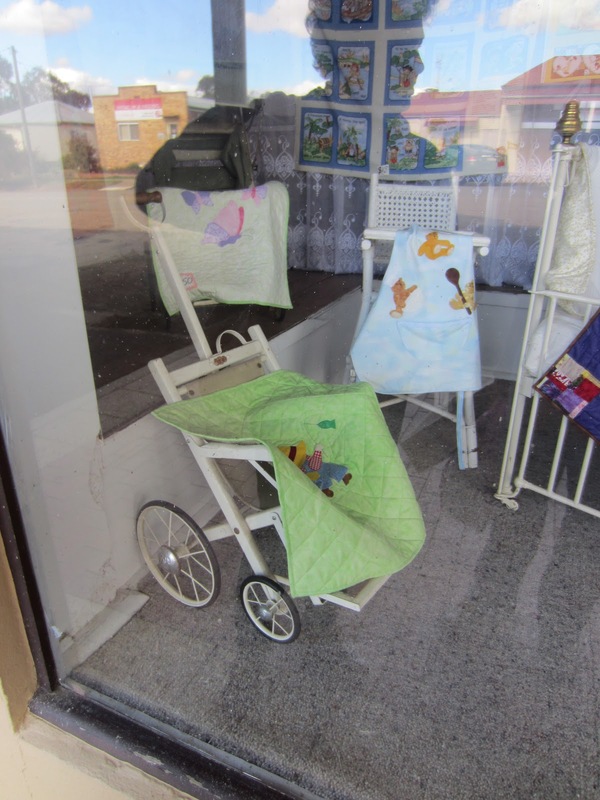 The Boorowa court house is now the home of the visitor info centre, and a handicraft shop. Mum bought Dad some ginger slice. We looked at all the lovely craft items, but I decided to save my money for some sheep poo on the way home. A giant bunya pine tree grows outside. We took a detour on our way home to the town of Harden. This was in the opposite direction, but well worth the extra drive. The area around Boorowa was populated by a high proportion of Irish settlers back in the early days of settlement. It is no wonder! There are rolling green hills, willow trees beside the gently curving streams, and sheep grazing peacefully on the slopes. It really must have reminded them of home. At a little farmhouse we stopped at the gate to buy strawberry plants. The kids' names were written on the honesty tin, and the table was an old baby change table. Harden and its sister Murrumburrah are both much more stately and grand towns than Boorowa. The houses are larger, more formal and feature decorative federation style trims. Note the little bridge needed to get over the deep gutter. There was another Vinnies to visit in Harden. 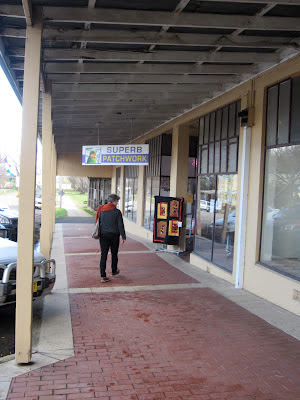 Mum thought it was sad that Harden had not been as "improved" as Boorowa, there were noticeably more buildings boarded up or in various states of disrepair. 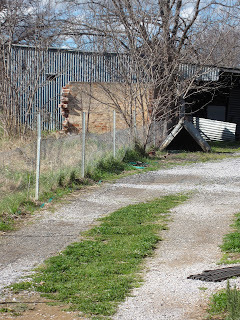 Even though in its heyday it must have been a much grander town. This house was dwarfed by an enormous loquat tree. I liked the steps leading up to the verandah. We headed back towards Canberra after having a look around. I took a photo of a ricketty bridge across a river. Trucks are not allowed over the bridge, and have to drive over a ford across the river. An even more dilapedated railway bridge ran beside the road bridge. At another farm gate we bought three bags of sheep poo for $10. On our last trip we brought back sheep nuggets and they did amazing things for my rose garden, so I was really happy to have found some again. Sheep poo really is excellent stuff. It comes pre pelleted, and unlike horse poo does not grown weeds. These looked like really happy cows! It was lovely to see the countryside looking so green and fertile. We saw quite a few sheep with twins, as the lambing season has just begun. The creeks were all flowing and the dams were full to the brim. It is certainly going to be a good season. I remember this pillowcase from my childhood, but I can't quite remember who or when or where. This dress was a new one which I found at an op-shop. 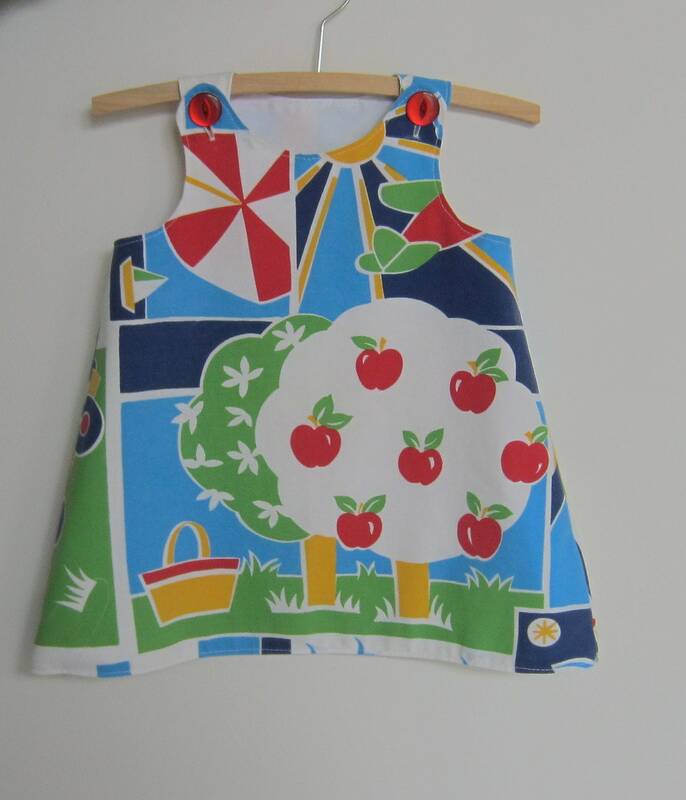 Now converted into a size 1 pinafore dress. Does anyone recognise this fabric? The label had no brand, but it said poly-cotton, Australian made. It is a lovely thick quality, so I am thinking Sheridan. Answers on a postcard please. Um, I think I need to redo this photo - doesn't look so good with the grey background. Photographing clothes is not as easy as I first thought! 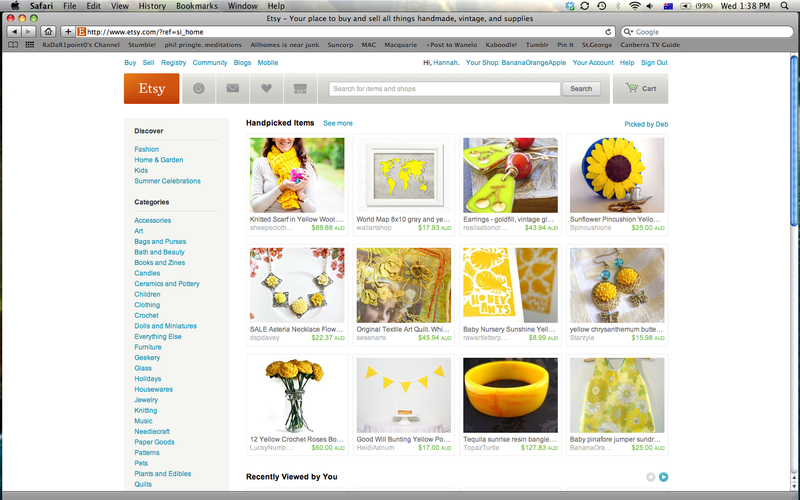 In other news, a treasury featuring one of my items was on the Australian front page today. I got so excited I took a screen shot. 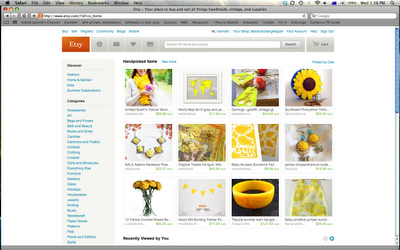 And shortly afterwards, the little yellow dress sold - along with another one with buttons. I am happy to be sending them off to the new owner in Victoria, and once again being grateful that we are allowed to have a special front page just for Australia. Well, if you have made it this far, you deserve a medal for stickability! Thanks for reading and I will be happy to answer any questions and read any lovely comments you might have for me below. PS The title of this blog comes from a sign on the way into Boorowa from Young. Thanks for the tour! Sounds like an eventful trip. I'm curious now about Australian possums. How do they compare to the ones in the US? Ours are ugly and I can't imagine taking their fur (straight hair really) and turning it into wool. PS - love the pickle's alpaca hair do! And I agree with Karen, I can't imagine making wool from opossum fur(hair?)-yuck. The Pickle is a riot-just like her mother. I loved your travel log!! Beautiful scenery and Loved the towns. :) We used to raise sheep and I loved lambing time. Lots of awesome photographs. How else would I know what the other side of the earth looks like. Thanks for sharing your lovely photos with us. I feel like I have been on the trip with you. They don't actually spin the possum hair on its own, they shave it off the pelt somehow, then spin it together with regular sheep wool (well, not actually regular - Merino fleece is the best in the world). On its own it could not be spun. Hannah, I LOVE reading your travel blogs. I feel like I'm right there with you!! The alpacas were adorable and the pickles look alike hair had me laughing out loud . . lol Loved the strawberries for sale and the photos of Harden were gorgeous . .loved the clouds!! Thanks for sharing a bit of Australia with us . . .I miss it! I read it all! Your daughter achieved the look well, I think. Using possum in a garment is really hard for me to fathom. They are definitely not known for their fur here!! It would be very interesting to me to see it! It's always a delight to travel Australia with you. Thank you. I love seeing your beautiful country through your eyes! Thank you for the tour! The names of the towns are so strange to me. They sound like Welsh. It does look like a lovely trip for 3 generations of "girls" form your family. So many precious memories.